Happy Quilting: Irish Chain Twist Quilt-A-Long - Piecing Top and Grand Prize Linky!!!! Irish Chain Twist Quilt-A-Long - Piecing Top and Grand Prize Linky!!!! Okay, So I am so totally excited for this week!! But before we get into it, first lets pick a winner of last weeks Stitching assignment. And great job to everyone that finished up their Blocks!!! I am so impressed with how many of you were trying Applique for your first time!!! 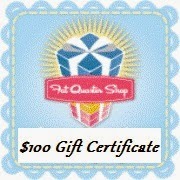 The Stitching Appliqued Chain Blocks winner who gets 2 PDF Happy Quilting patterns is . . . Yippee!!!!! I am so very excited. So let's get right to it. We will start with the Layout. Once your blocks are all laid out you are ready to start sewing them together. I like to sew my blocks one row at a time. You can chain stitch them, but I find it can easily get confusing and I often end of messing up my rows. So I just like to place the first block onto the second and sew a 1/4" seam (shown in row 1) , then add the second block to the now sewn together first and second block (shown in row 2), and continue adding blocks (shown in row 3). That's a quick overview so let me go into a bit of detail on how I like to sew my rows together. First, I stack all of my blocks in each row on top of one another so that they are manageable. The first block in the row is on top of the stack and the last row is at the bottom. I like to slightly stagger my blocks rather than make a standard pile because it just makes it easier for me to keep everything in place, I think because it gives you a small visual of the row. Then I take the first stacked row and move it over to my sewing machine. I leave the other rows where I have stacked them up from the original layout ;) Once again, my first block in the row is at the top of the stack, and the last block in the row is at the bottom of the stack. Then I take the first two blocks from the stack and place block 2 onto block 1 with right sides together. You can pin these if you like, but where you aren't aligning any seams, it is fairly easy to just align the blocks as you go. Sew a 1/4" seam along the edge. Now cut your threads. Open your now sewn together first and second blocks and grab the next block on the top of your pile. Place block 3 onto the edge of block 2 with right sides together. Once again, stitch a 1/4" seam along the edge. Clip your threads, open your now sewn blocks and add the next block at the top of the pile. Continue in this fashion, until you have sewn all of the blocks in the row. With your row sewn together, place it back in your original layout. Then you are ready to start Row 2. Pick up your stack and take it to your sewing machine. And once again, add one block at a time until the row is sewn together. Now press the seam allowances in all of your rows towards the X Blocks. This is going to allow you to nest your seams down the line. And before we get to far ahead, I wanted to share a few helpful hints that might help your rows come together a little more accurately. First off, when you are sewing the petal blocks, be sure to sew right along the stitched edge. You can easily see your secure stitching, so use it as a guide to where the petal is. And because the Patchwork Block has more seams than the other blocks, you might find that they are sometimes just a little bit smaller than the X Blocks. No worries. First, place the blocks with right sides together and center the seam of the X block in the middle of the sashing strip in the Patchwork block. This is going to put the slight shortness evenly distributed on either end. An with your rows all stitched together and pressed, you are ready to finish your quilt top!!! All you have to do is sew the rows to each other. This is just like making the rows only on a larger scale. So start by placing Row 1 onto Row 2 with right sides together. Nest each of the seams and pin them in place. Then I like to place another set of pins at the center of each block just to keep them from shifting. Sew a 1/4" seam along the pinned edge. Once you have finished the row, lay it back out with your other rows. Now place Row 3 onto the now sewn together Row 1 and 2 with right sides together. Once again, nest and pin each of the seams and then add another set of pins along the center of each block. Sew a 1/4" seam along the pinned edge, backstitching at the beginning and end of each row. And now you can stand back and enjoy your beautiful Irish Chain Twist Quilt-A-Long Top!!! Your finished with your top!!! Yippee!!!!!! 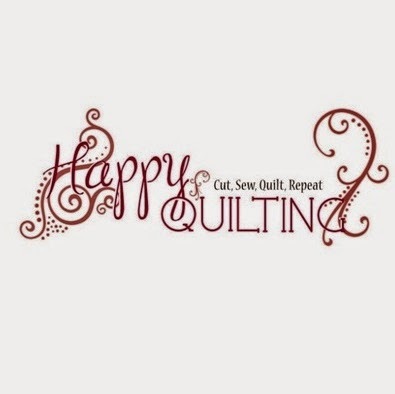 And while you are enjoying it, don't forget to add your Quilt Top to the Happy Quilting Quilt-A-Long Flickr group and to post it on social media with using #irishchaintwistqal. We all want to see your finished Quilt Top and enjoy along with you!!! 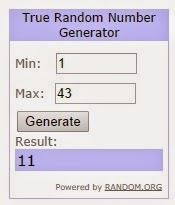 And with your Quilt Top complete, you are ready to link up to the Grand Prize Linky!!!! Oh, I am so very excited!!!! I can't wait to see all of your Quilt Tops!!!! There are 4 Grand Prizes that you are hoping to be picked for is . . 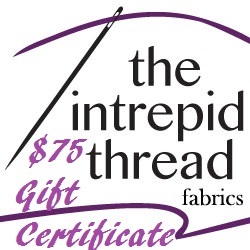 The first 2 winners will each receive a $100.00 Gift Certificates to Fat Quarter Shop and the next 2 winners will receive a $75.00 Gift Certificate to The Intrepid Thread !!! Yippee for some total Shopping Sprees!!! In order to be eligible to win the Grand Prize you need to Link Up your completed project top (not quilted yet, just the project top) at the end of this post!!! And I have some good news. I am giving everyone more time!!!! So if you got a little held up somewhere or a little behind, no worries, you have lots of time to still get done!!! Originally, the QAL was going to end of April 13th to coincide with the releasing of my new book, Irish Chain Quilts. But since that date has been pushed back, I decided, why not push the finish of the QAL back a bit too to give everyone a little more time to finish up ;) So you have an extra 10 days!!!! The Quilt-A-Long Parade will now be on APRIL 23RD and you have until the early, early morning of April 23rd to get your project top sewn together and linked to be entered :) But remember, adding your picture to flickr or instagram doesn't link you up, You have to have a link at the end of this post to be entered to win one of the Grand Prizes. Now, as just mentioned, you only have to have your project top done to enter into the grand prize link up . . . However, I wanted to encourage you to finish these projects and not set them in a pile of "to be quilted" so I am planning a Parade for the 23rd of April :) Now I just gave everyone an extra 10 days, so it should be lots of time to finish your quilts up!!! The parade will show off all of the quilted and bound Irish Chain Twist Quilts!! So, how do you finish up those quilts??? Once you have your quilt Basted, Quilted, and Bound it is ready to be showcased it in the Parade. In order to have it in the parade, I need you to please send me an email (happyquiltingmelissa@gmail.com) with your favorite finished Irish Chain Twist Quilt picture attached as well as the name (your name) you would like your photo listed with, where you are from, and a blog or flickr photostream link if applicable. You can email me anytime from now until the evening of April 22nd and I will get you added to the Parade!!! I am so looking forward to seeing everyone's finishes!!! You can decide if you would like to add your finish picture to the Flickr group and Social Media with #irishchaintwistqal now or wait until after the parade to keep it a secret :) Grand Prize winners will be announced on April 23rd along with the amazing parade filled with all of your beautiful quilts!!! I can't wait!!! I know this is just going to be an awesome parade!! I can't wait to see your finished projects!!! Thank you so much for quilting-a-long with me!!!! Now, off you go to finish up :) Have a Happy Quilting Day!!! I love this! And the colors you picked are so pretty. I'm working on your Star surround quilt now and I love your clear easy to follow directions. I just may have to do this Irish Chain next! I can't wait to retire so I can use all of the wonderful hints from your site. Your colors are beautiful. I haven't tried anything from your site but next year will be my year. Good Luck to all the Finishers! I sadly got too far behind and now have other more important projects to finish by May. Thanks again Melissa for all your hard work putting this together! This has been so fun, Melissa. Thank you so much for all the time and effort you have put into this for us. Thanks so much, Melissa! This has been a really fun QAL! I stepped out of my comfort zone using a dark background and I LOVE it! Can't wait to get it all quilted! I just came across these beauties! I would love to do one myself! This is such a great variation of this traditional design! Thanks so much Melissa, for sharing this! !